Ah, Kaweco: The German writing implement company is almost a century older than I am, yet I just learned of them this last year. 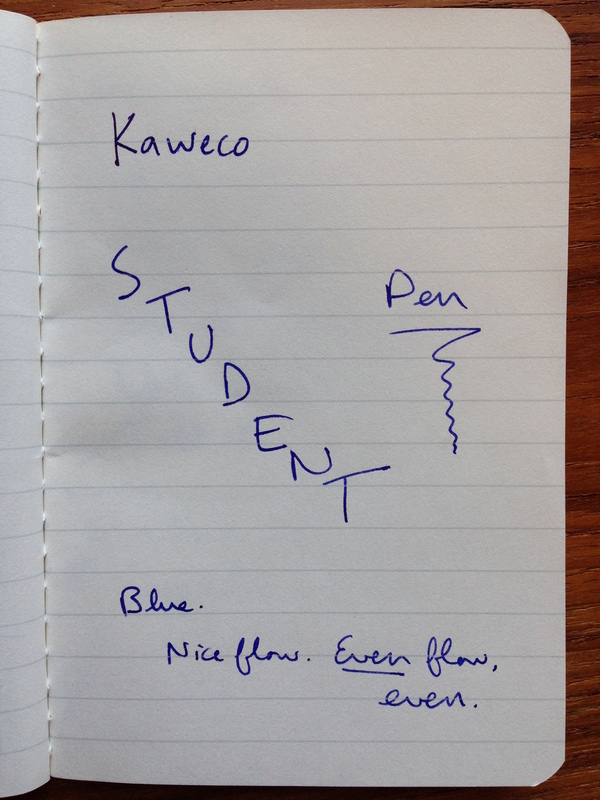 Here I bring you a review of the Kaweco STUDENT Fountain Pen. 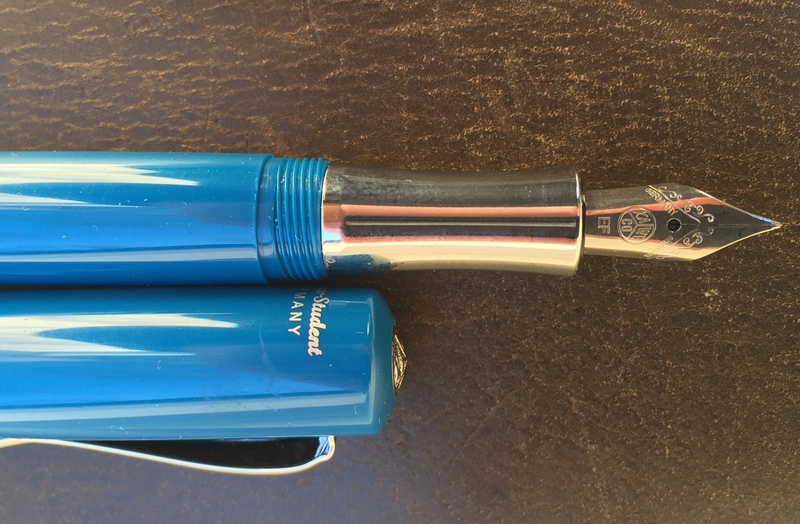 The color of the pen is Vintage Blue; the nib is Extra Fine. The STUDENT Fountain Pen feels just about perfect in the hand–ballpoint pen writers will find it to be of suitable length. It’s sturdy but not heavy. It can fit just fine into a pants pocket, though you may not want it bumping up against your keys. (I prefer a case for my fountain pens.) You will notice in the image above that there is a built-in clip. The vintage blue color and silver clip make it look really good in a front shirt pocket–and it will stay there, too. I’m still new to the world of fountain pens, but I do know that even flow in fountain pens is not a given. With the STUDENT pen it’s all smooth sailing. This particular pen ships with royal blue ink, which looks fantastic. It’s easy–even for fountain pen neophytes–to buy and pop in ink cartridge refills. As to using this pen posted or unposted (i.e., with the cap on or off), I suspect the intention is to use it however you prefer. The downside to keeping the cap off, of course, is that you might lose it! With the STUDENT fountain pen, long periods of writing might call for keeping it unposted, so as to slightly reduce its weight. Nice, even ink flow. The pen is amply sized. I have medium to large hands and found that when the cap was posted the feel was hefty but comfortable and well-weighted. A smaller hand could use the pen unposted. I liked the rich blue of the barrel. Not gaudy, but also not muted. You can check out Kaweco’s STUDENT fountain pen line here. (This pen is Item #10000781, and came with a nice tin gift box.) And if you are so inclined you can order the STUDENT pen via JetPens or Most Wanted Pens. Many thanks to the fine folks at Kaweco for the pen for review! Check them out here. This review is also cross-posted at Words on the Word.